Bill Gillespie is a member of the award-winning BBQ team, Smokin’ Hoggz. Together, they have won numerous competitions, including the Jack Daniel’s World Champion Invitational, and Bill’s weapon of choice is the Weber Smokey Mountain Cooker. Delicious creations that Bill produces on his cooker include Pulled Pork with Root Beer BBQ Sauce, Stuffed Sausage with Prosciutto and Cream Cheese, and Maple Glazed Salmon. 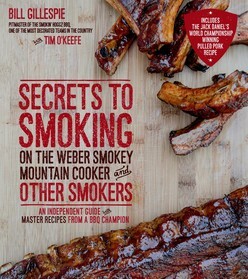 Not only will Bill show readers exactly how to master the Weber Smokey Mountain Cooker, but he’ll also provide his most-prized recipes to cook on the grill. Bill makes cooking on the Weber Smokey Mountain Cooker easy, with simple instructions, personal anecdotes and of course, 85 out-of-this-world recipes. Whether readers are just starting out, or are more seasoned and looking to up their BBQ skills, with this guide they will be creating delicious dishes that’ll wow the whole neighbourhood.